I found this pair of mira stars that no one seems to have observed. At least there are no observations in AID. It is the close pair of VX CrA and VW Cra. The stars are of equal brightness (mag 11 to 16) and are separated by only 83". But what is special is that their lightcurves are almost synced, like two blinking eyes in the sky. 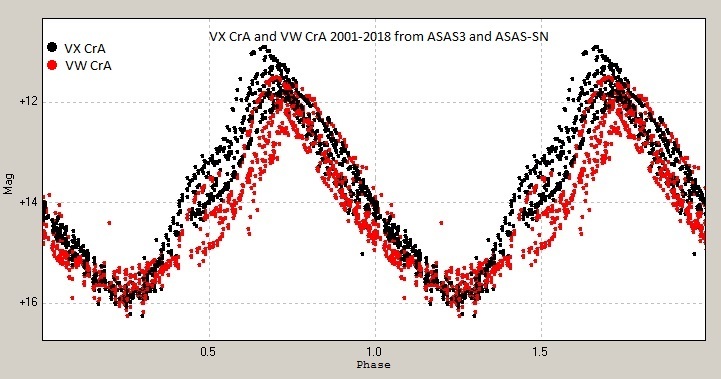 In the attached files I put together the observations from ASAS-3 and ASAS-SN between 2001 and 2018. Their similar period and range were noticed already at their discovery 1927. Have anyone heard of a similar pair of stars? In absolute terms they could be separated by several 100 lightyears, so I think it is a pure chance, but it must be a fine pair to observe.